Three modules are available: the CFP version for validating CFP-related products and system equipment, the CFP2 version for deep analysis of CFP2-related products and systems, and the cost-effective dual-port CFP2 version for deeper system testing and a special test application for sophisticated test signals. The CFP-based test module is an indispensable tool for product development, system verification, and new service deployment testing. 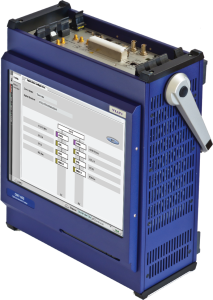 The industry’s first CFP2 test module, with its advanced error analysis application, gives designers unprecedented insight into the root causes for bit errors and greatly reduces CFP2 technology cost, space, and development time. The dual-port CFP2 module produces up to 1.2 T of real-time traffic when fully loaded into the ONT-612 mainframe.